The tickets purchased here entitle you to one photo op with Jamie Lee Curtis for each ticket purchased. These tickets will be sold online only and must be purchased in advance of the show. These tickets are DAY SPECIFIC. So if you purchase a Saturday ticket you must redeem it on Saturday. If you purchase a Sunday ticket, it must be redeemed on Sunday. This unprecidented special appearance has limited photo op ticketing options available. Once they are sold out, there will be no more added. 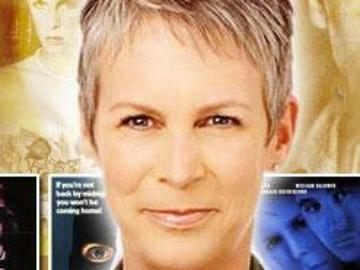 So don't miss your only chance to get your once in a lifetime professional photo with Jamie Lee Curtis. **Tickets will be sold as day specific tickets. Meaning if you purchase your ticket for Saturday's shoot time, you MUST redeem your ticket on Saturday. Please do not bring gifts for the guest or items for the guest to autograph in the photo room. Yes, there is a cap on the number of ticket that will be sold. No more will be added after the tickets have sold out. Photo Ops are professional photos taken with your favorite celebrities with professional quality lighting and camera equipment. What do I get with my photo op? You will receive your print shortly after your photo is taken printed on professional (dye sublimation) photo printers on 8×10 glossy paper. How long do I have to wait for my print? Typically your print will be ready within two hours from that particular photo op. You can feel free to go back into the convention and then simply come back out to get your print. We will also announce on the @CelebPhotoOps twitter when new photo op prints become available. Print times may decrease or increase based on print volume. Can I get my print autographed? Yes, sharpies stick very nicely to our prints. The price of an autograph is not included in the photo op price. There is no guarantee that photos will be ready in time to have them autographed, especially for later day shoots. No refunds will be given if you do not have time to get your print autographed. Other questions you may have…. When should I arrive for my photo op? We recommend you get there about 40 minutes early. DO NOT BE LATE! We get the lines through very fast and when the line is done, the celebrity will often leave the photo room. We are sorry but there are no refunds for missed photo ops. Do you clean up or alter my photo for me? We are sorry but we do not do any cosmetic alterations. Try and do any make-up application or hair before coming to the photo op. How many people can I have in my photo? Up to two adults per photo. Families may have up to two adults and up to two children (under 12). Can I get duplicate prints if I want more than one? Yes, it is an additional fee of $10 for each duplicate print. Duplicate prints will be printed on-site and are available at the convention. Yes, it is an additional fee of $10 for digital copies. Digital copies will be available 7 days after the convention ends at our website www.celebphotoops.com. You can use the digital copy for posting on your facebook, twitter avatar, Christmas card, desktop wallpaper, etc. It is a 300dpi jpeg. Be sure to bring your printed ticket, other than that we suggest you bring as little as possible to the photo op. It helps the line immensely if people do not show up with armloads of items. Please no props. Should I remove my glasses? It is best if you do. The lighting we use is very bright and often causes glare on glasses. Do you look for blinks in the photos in case I do blink? We do our best to try and look for bad shots and or blinks and then retake the photo. Remember, it is a photo you will keep for a lifetime, make sure and try to follow the photographers instructions. We ask that you do not grab the guest, hug the guest, attempt to kiss the guest or ask the guest to kiss you. Any inappropriate behavior will result in your immediate removal from the photo op and the convention. Due to the limited nature of this event, this ticket is non-refundable after 11-10-12. If you require a refund,you must do so prior to 11-10-12.